I had put off getting a new puppy because of all the puppy work. We keep our ranch dog in the house so he learns the ropes. In time, they learn a whole lot of words, which really helps in the future. They learn manners and basic commands. At twelve weeks, Spencer knows how to come, sit and what “NO!” means. He also knows “get down” and “get your toy”. He’s also jumping at the door when he needs to go potty. Usually. Yeah. He makes potty mistakes. And he chews up our shoes, tissues, the toilet paper and almost got my checkbook. But I knew he’d do that before we got him. All puppies do. But we do have dog crates, and brought one into the new greenhouse for Spencer’s “house”. We keep him out with us most of the time, but when we need to be outside and can’t have him with us, like when we’re operating vehicles in the yard, Spencer’s given a dog biscuit and put into his house. At first he howled, barked and whined something awful. But after awhile, with nobody paying attention to him, he finally quit. Now he’s gotten used to it. He spends the night in it, then is let out early in the morning to go potty outside. The crate remains clean and he’s learned to go outside. It’s a huge help in training a pup. He tried pullng the tail feathers on one of our turkeys, but I yelled “No!” and threw a feed can down by him and he stopped. Now he would like to, but doesn’t try. We don’t want him to get used to harrassing the poultry. When he gets bigger, he could do some serious damage or even kill chickens. It’s easier to train him now. Although he’s still small, he’s growing by leaps and bounds. He still likes to sit on our laps, but no he takes a lot more space than he did three weeks ago. 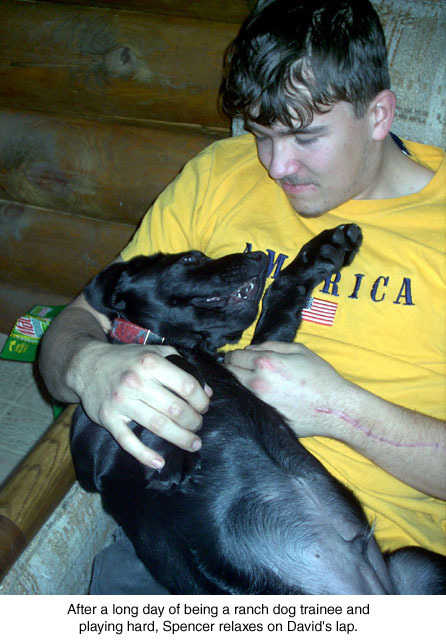 David is his special love because he takes time to play with him every day and Spencer really gets into that. But when he gets tired, he lets David pick him up and lay him on his back on his lap. It’s great to be a puppy! I’d like to comment on an answer you gave to Bernard Falkowski in the Jan/Feb 2008 issue of the magazine. Brined pickles do not need to have vinegar added to their fermentation process. In fact, those pickles he remembers that were fished out of a wooden barrel were salt brined. If vinegar is left out of the fermentation, the resulting pickle will be lacto-fermented, meaning that the brine will be full of those good lacto-Bacillus bacteria. One recipe that I use calls for 6 tablespoons of salt in a half gallon of water for the brining liquid. Use a crock that holds about one gallon total, or a gallon glass jar. Place in it a couple of grape or horseradish leaves if you have them. They keep the pickles crisp. Then add 3 or 4 dill flower heads, 2 or 3 garlic bulbs (that’s whole bulbs divided into cloves, not just 2 or 3 cloves,) and 4# of cucumbers, not too big but they don’t have to be very small either. Pour the brine over all this, weigh it down with a jar filled w! ith water or rocks, and cover with a clean towel. In the summer these are ready to eat in one week. The downside is that they then have to be refrigerated to keep for a longer time; I’ve kept mine as long as 6 months. You could also can them after they have finished their fermentation, but they lose their pro-biotic bacteria and some of their crispness. if it’s a mineral, or derivative of aluminum, or what else it might be? Thanks for all your help and interesting articles. Yes, some pickles in a barrel were salt brined. But many weren’t. We had a small general store when we lived in New Mexico and Bob sold pickles in a barrel that were floating in a vinegar brine. There are literally hundreds of dill pickle recipes and most of them are great. Love those pickles!!! will need to do so? Again thanks very much for sharing your know how. Well, that depends; on what kind of chickens you buy (heavy hens eat more than light ones; light ones lay more eggs but can’t make much meat when the time comes), what else you feed them (you can’t feed laying hens just corn and get lots of eggs; the free range will help, but the need a mixed grain, such as scratch feed to make sure they have adequate protein) and how much space you have available to raise corn (a city lot or a corn field). I buy my dozen hens, four big turkeys and two ducks 100 pounds of feed twice a month in the winter and once a month in the summer when they are on free range. My hens are araucanas and mixed banties, so they are smaller hens and are very active. ANY feed you raise yourself is a great help. I raise plenty of “livestock” feed in my garden; weeds, spent crops, bad tomatoes, extra squash, carrot tops, corn cobs and a whole lot more. If you have enough land to raise corn, by all means, do it, even if you don’t raise ALL your chicken feed. In figuring how much corn you can raise on X number of square feet or acres is impossible, as it depends on what kind of corn you raise, what kind of soil you have and your farming practices. Each corn stalk will usually produce two good ears under decent growing conditions. This would feed your 5 “average” hens for one day, provided you also had other feed (free range or wheat/oats/barley) mixed in.